Two Kashmiris namely, Mulla Bhadur and Mulla Hussain sons of Mullah Mahmud Kashmiri were sent to Kishtwar under orders of emperor Shah Jehan. 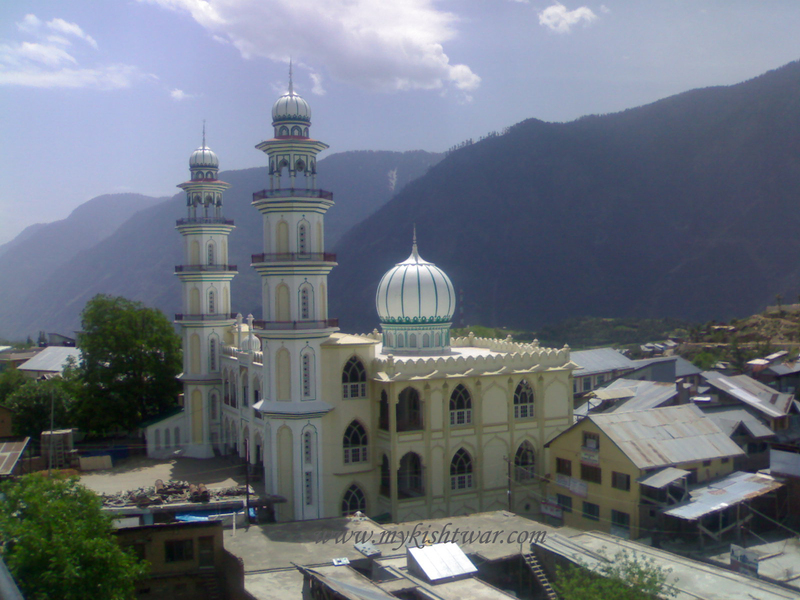 They constructed a mosque ‘Masjid Khawaja Gareib’ in the heart of Kishtwar town. The Jamia Masjid of Kishtwar is the oldest mosque in district Kishtwar. It has already been said that a mosque had been constructed in Kishtwar before 1650 A.D. Masjid-e-Faridiya and Jamia Masjid Kishtwar follow. The Jamia Masjid of Kishtwar was one of the biggest mosques in Jammu province. Its premises are vast. The Muslims of Kishtwar had constructed a grand Jamia Masjid with great diligence and sacrifices. The new Jamia Masjid shall be a three store yard complex with two minarets of 130 feet height. Muslims in each mohalla and village have constructed a mosque for worship. the devout among them perform ‘Namaz’ five times a day. The regular ‘Azaan’ from mosques reminds every believer of the existence of God and man’s duty to pay his obeisance to him. 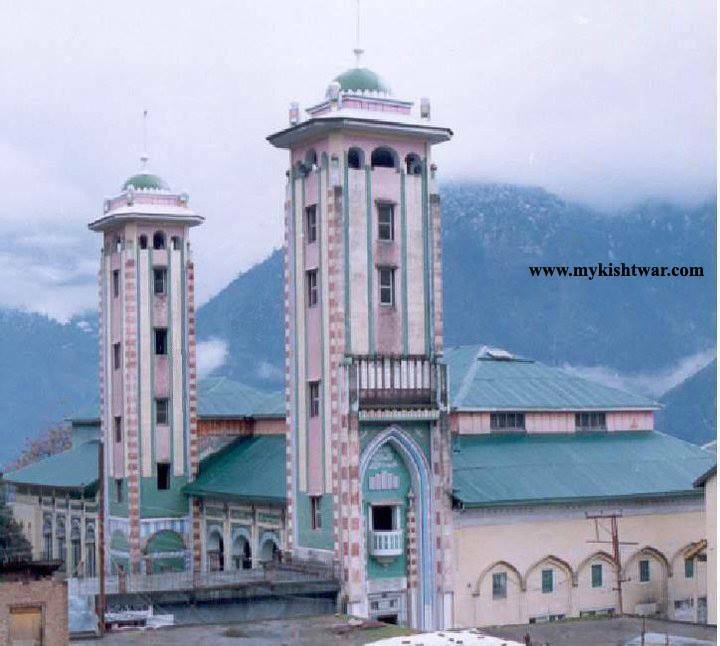 The Jamia Masjid Kishtwar is the biggest and the towering mosque in the heart of city. its construction was, first started in 1941 A.D. its two minarets were as tall as 60ft. each. unfortunately, the mosque got gutted in a mysterious fire on the night of 1st January 2001, putting every one under pall of gloom. With the generous contribution of the local population and the co-operation extended by Auqaf-e-Islamia, the three stored complex of the mosque is nearing completion. The complex has a number of shops. its new minarets are 130 feet high. On completion, this will be one of the biggest mosques of Jammu and Kashmir which can accommodate thousands of ‘Namaziz’ at a time. it has the potential to attract tourists to see its architecture and the grandeur. Near by is the grand and magnificent of Islamia Faridia Higher Secondary School and College of Education managed by Auqaf-e-Islamia, Kishtwar. In addition to Jamia masjid there are Masjid Bazar, Masjid Kamgar, Masjid Faridiya, Masjid Asraria, Abu Bakr Masjid and Gorian Mohalla Masjid in the town. In addition to Jamia masjid, the Friday Namaz is offered in a couple of other mosques also in the town. Among the mosques outside the Kishtwar town the mosques of Atholi, Chhatroo, Warwan, Marwah, Cherhar, etc are worth seeing. There is an Islamic Darasgah, Asrar ul Uloom, attached to Hadapora mosque, where the new generation is brought up on Islamic teachings. it is the first Islamic Darasgah, in this area.